The Independent National Electoral Commission (INEC) has identified some nine categories of occupation distribution of registered voters for the 2019 general elections in Nigeria, reports ITREALMS. Occupation is defined as job, day job, profession, work, line of work, line of business, trade, employment, position, post, situation, business, career, vocation, calling, craft, skill, field, province, walk of life of an individual. This shows that students outnumbered every over occupation categories with some 22,320,900 registered voters. INEC, ITREALMS gathered also listed farmers/fishermen, housewives, business persons, traders, civil servants, public servants, artisans and others. According to INEC, students category which has a record of 26.57 per cent of the total registered voters is followed by farmers and fishermen with 13,630,216 registered voters, which is 16.23 per cent. In the top third category are the housewives with 11,844,079 which accounts for the 14.10 per cent, just as the Business Persons came fourth with 10,810,006 worth 12.87 per cent. While Traders came handy in the fifth person with 7,568,012 which accounts for 9.01 per cent, followed by others with 6,021,741 with 7.17 per cent. 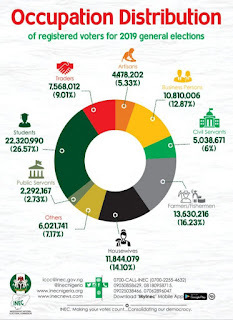 For the Civil servants with 5,038,671, thus amounts to 6 per cent, even as public servants got 2,292,176 which is a record of 2.73 per cent and finally Artisans having 4,478,202 with 5.33 per cent.